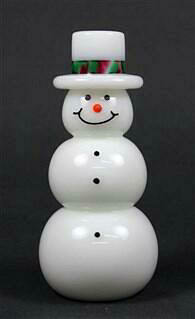 Vitrix art glass snowman. Done in a variety of designs this is the Top Hat Snowman. Pictured with a traditional white top hat and rainbow colored band. He has a bright red nose and black buttons which, adds a nice holiday touch. Approx. 5.75" h x 2.58" w. Signed Vitrix and dated.